Delayed its release until nearly 10 months, rumors about the White iPhone coming back to warm preached. 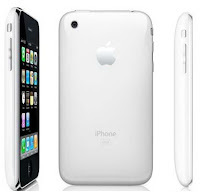 Latest news mentioning, Apple started producing white iPhone. Reportedly white iPhone will be launched in spring 2011. Hon Hai Precision Industry Co. Ltd. which is affiliated with Taiwan's Foxconn Technology Group, will assemble the white iPhone. Another indication that strengthen this news is when the Senior Vice-President of Marketing at Apple, Phil Schiller last month to post on Twitter. He mentioned the white iPhone will most likely go on sale in the spring of this year. So, we wait for the latest news about the launch of this white iPhone. My take on it is that Apple has suffered a lot from a tsunami in Japan and their release of the iPhone 4 in white is just an attempt to draw public attention from the delayed iPhone 5 launch.